Upswing offers leading training opportunities to circus professionals at any stage in their development. Committed to providing inclusive opportunities and making circus careers accessible to all, our training is always free or affordably priced. Professional development programmes offer a combination of training and mentorship to significantly impact the careers of artists entering the community. Step Up and InFlight are courses designed to nurture emerging talent in British circus, whilst increasing diversity in the art form. 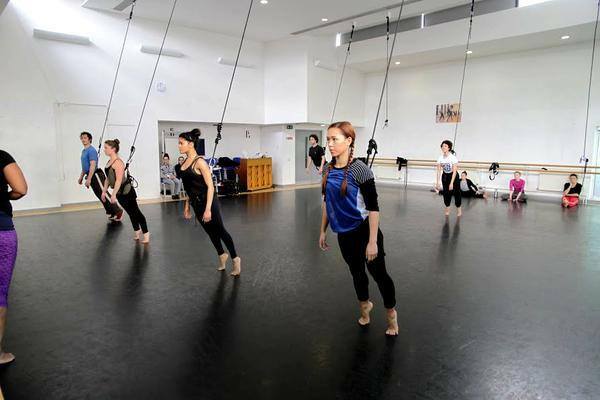 Step Up is an intensive two-week programme in acrobatics and aerial skills. It kickstarts circus training for artists with physical experience as they create a short routine that can be used as an audition piece and up to three artists will be selected for further mentorship with Upswing. Step Up is supported by The National Centre for Circus Arts with the next programme coming soon. InFlight was delivered in 2015 and 2016 in partnership with WAC Arts and Scarabeus Aerial Theatre as a development of Step Up. Applicants were from an even wider range of physical backgrounds including martial arts, parkour and dance, but all were new to aerial. This programme ran over two years providing training in trapeze, aerial silks, rope, abseil and bungee harness, with an incredible opportunity to perform in InFlight From Home at Hampstead Town Hall at the end.